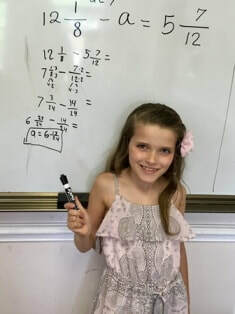 Math and writing Summer Camps are serious learning camps run by Mina's School of Great Falls. Children are evaluated to identify specific skills that need to be developed. Staff then proceed to remediate weak skills and develop new ones. Developing self-confidence and self-esteem are important goals as well as the academics. children enjoy themselves while making significant strides in math. Our camps in summer can help you to learn a lot about Mina's School of Great Falls (full day) teaching method. See our school website at www.minaschool.com or just search Mina's School of Great Falls. Our students gain a strong foundation in math, writing, and reading using a step-by-step learning process which enables them to thrive and excel academically, while having fun.